Local companies are keen to profile South Africa’s industrial capabilities at the 12th Latin American Defence and Security Exhibition (LAAD), which is currently underway in Brazil, with nearly two dozen South African companies attending the event. South African companies are participating in the fair through the Department of Trade and Industry’s (DTI’s) Export Market Investment Assistance Scheme (EMIA). The scheme aims to increase exports of South African manufactured products. 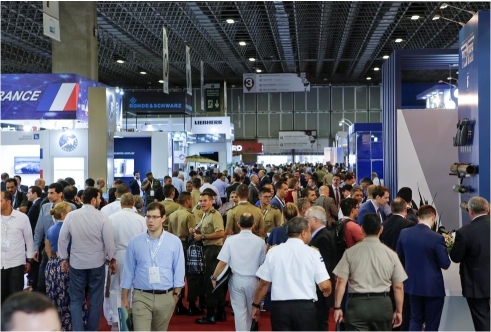 LAAD, which started in the capital of Rio de Janeiro on Tuesday, is a leading Latin America Defence and Security event. The exhibition gathers international and national companies that provide technologies, equipment and services for armed forces, special forces, police, homeland security and security managers from large companies, service concessionaires and critical infrastructure. South Africa’s offerings comprise textiles, body armour manufacturers, radar and communication systems, search and rescue boats and small to medium range arms. South African Consul General in Brazil Malose Mogale commended the efforts undertaken by the DTI in bringing the diverse crop of companies into the South American region and emphasised the strategic importance of Brazil to South Africa. He said companies looking to explore Brazil should not neglect the important aspect of conducting due diligence on companies that they are looking to explore partnerships or transactions with. “As the mission our primary aim is to urge South African companies to guard against compromising their intellectual property. We have noticed that this is one aspect of conducting business that is generally neglected and we request that they approach the mission to confirm the authenticity of companies they are engaging with as we have a database of companies that we update regularly,” he said. The Consul-General urged local companies to ensure that certain aspect of their production should remain local as that will be beneficial to job creation and growing the economy of the country. The exhibition will conclude on Friday. Over 38 000 people are expected to visit LAAD 2019. The event will see the participation of 450 national and international companies. In the 2017 edition, more than 2,000 meetings between 183 official delegations from Brazil and abroad and the exhibitors took place during the event. South African companies attending LAAD 2019 include Alaris Antennas, Armscor, Bayside Marine, Cape Aerospace Technologies, the Council for Scientific and Industrial Research (CSIR), Denel, Etion Create, Explorer Cases, Floida Engineering Services, Lantern Engineering, Milkor, Redeployable Camp Systems, Reutech, Rippel Effect Systems, the South Africa Aerospace Maritime & Defence Expert Council, S-Plane Automation, Twiga Services and Logistics, Veecraft Marine, Zebra Sun and Zero Industries.